Sept. 24, 2018 - Building on the success of its high-speed equipment, Gilbert has added to its product line a planer for mass timber lumber. Built to the same high-quality standards which established its reputation for its planing equipment, the Mass Timber Planer was designed to meet the high expectations of the engineered wood industry for the production of glulam timber, CLT timber and all types of beams. The equipment has a heavy-duty frame and is designed to plane mass timber up to a thickness of 16 inches and a width of 36 inches. 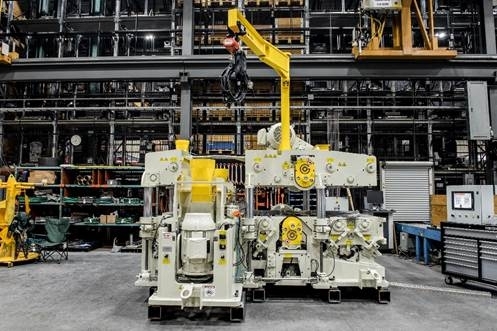 Furthermore, the Gilbert Automatic Positioning System which controls the cutterheads and axes ensures optimal operating precision allowing for the production of high-quality lumber. “Our clients are breaking new ground in engineered wood products and we are pleased to offer Gilbert expertise to support them in their projects with our high-quality equipment which will, without a doubt, respond to their expectations,” states Heidi Danbrook, sales director at Gilbert. Gilbert is proud to have its first planer running in a high class glulam operation in Ark. For more information regarding the Gilbert Mass Timber Planer, sawmills are invited to visit the website or to contact the sales department at 1-418-275-5041 ext. 2234. For the past 30 years, Gilbert has been a recognized leader in the design and manufacture of forestry, sawmill, construction and surfacing equipment. The company is located in Roberval, Que., and employs almost 100 people who devote themselves to offering the best planer expertise and technology on the market.